Posted on April 10, 2012	by Lou Murray, Ph.D.
Spring has sprung with a vengeance in our yard. Flowers are popping out everywhere it seems. I’m going to show you some of my pretty flowers before getting to the food harvest. 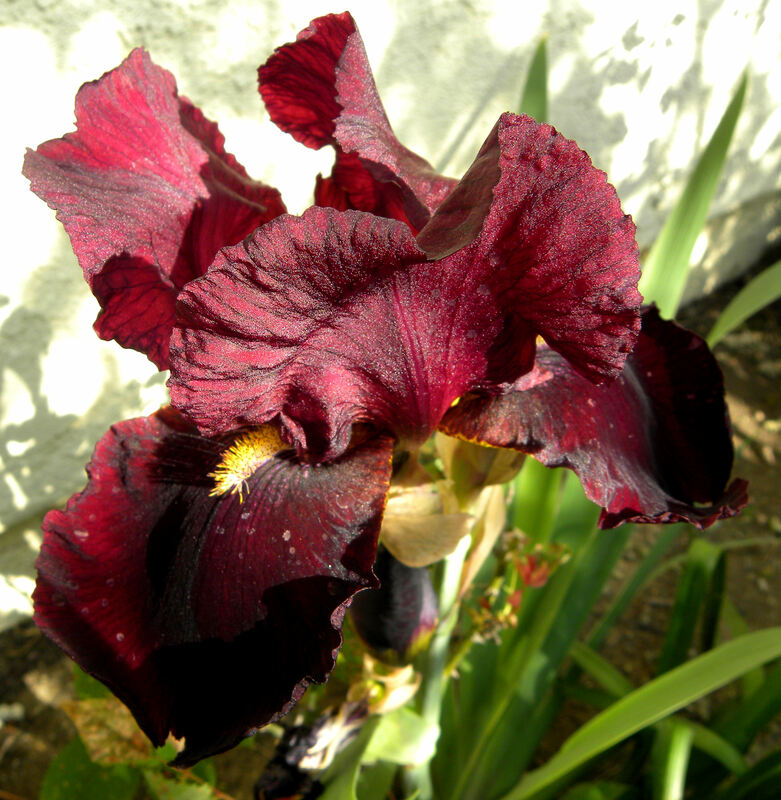 Ida Red is a new color of bearded iris, the reddest of the irises. I got this one from http://www.greenwoodgarden.com. I just love it. When it's ready to divide in the fall, I plan to interplant it with some nice white irises. 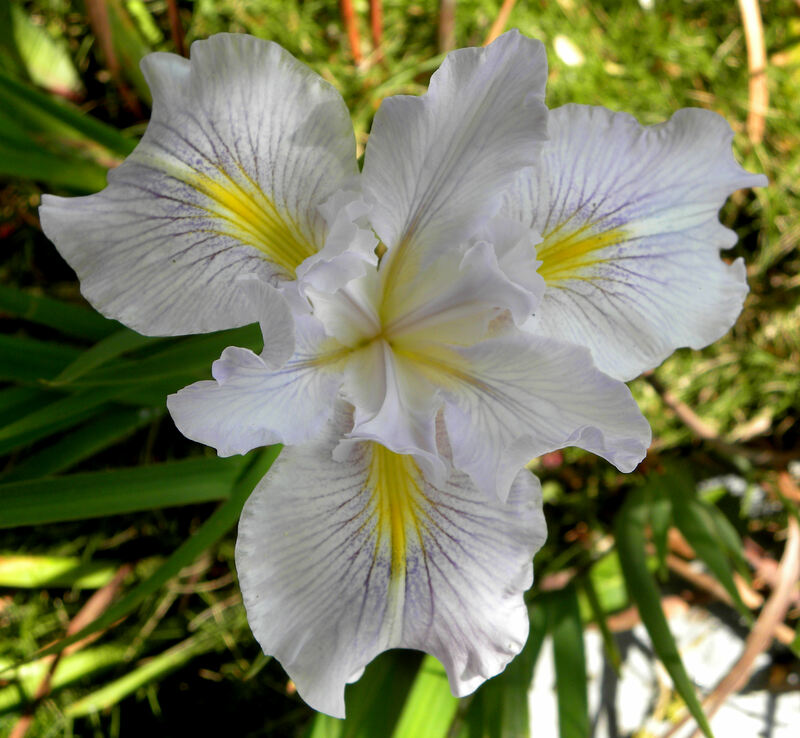 Dutch iris are non-native, but this Douglas Iris is native to California. I just love these. I'm thinking that I should get some more to plant around the pond. 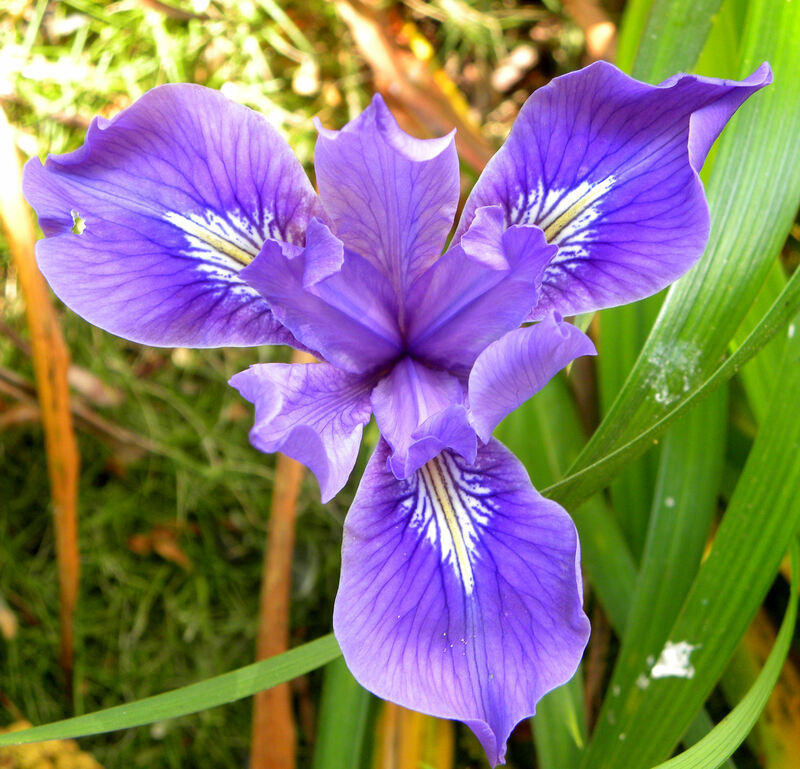 This is the purple Pacific or Douglas iris. 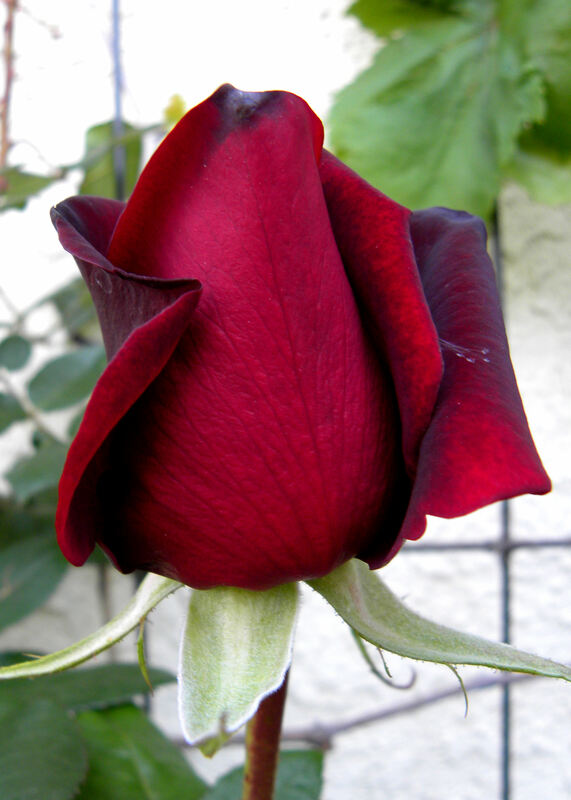 I also have a white one, but it isn't in bloom at the moment. They are good plants for riparian habitats, areas that are watered to get 32 inches of rain a year. I cluster my riparian plants to conserve water. My paperwhites stopped blooming long ago. 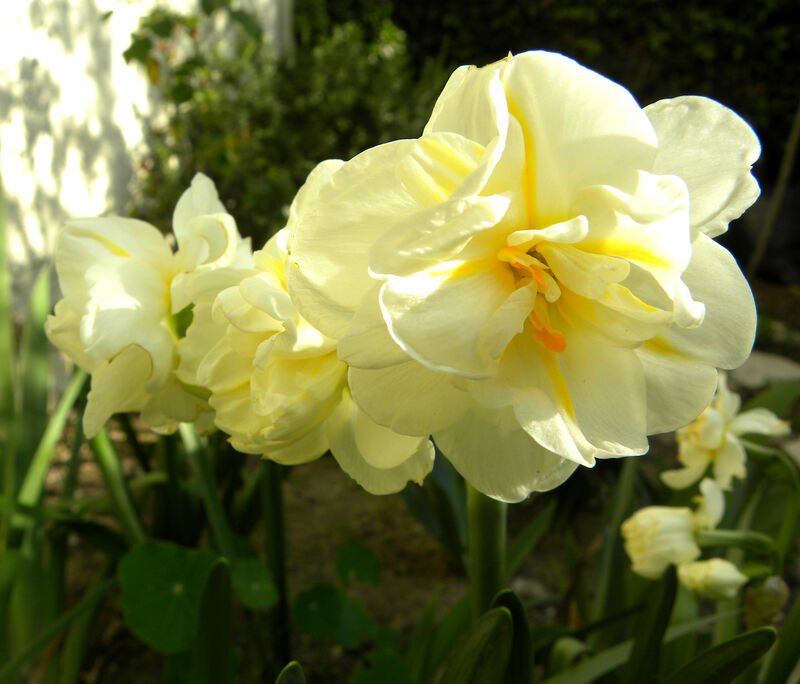 The Tahiti Narcissus just finished. Now it's the turn of these lovelies. Another view. 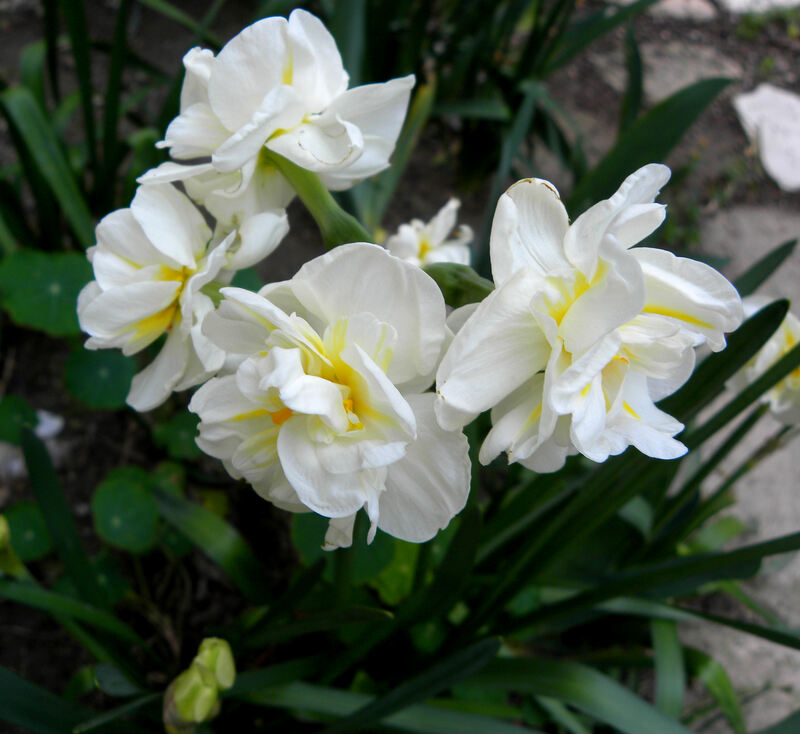 The first photo showed these narcissus a bit more yellow than they really are. The whole back yard that isn't in raised beds is covered in nasturtiums. I feed the leaves to the chickens. They don't seem to care much for the flowers. 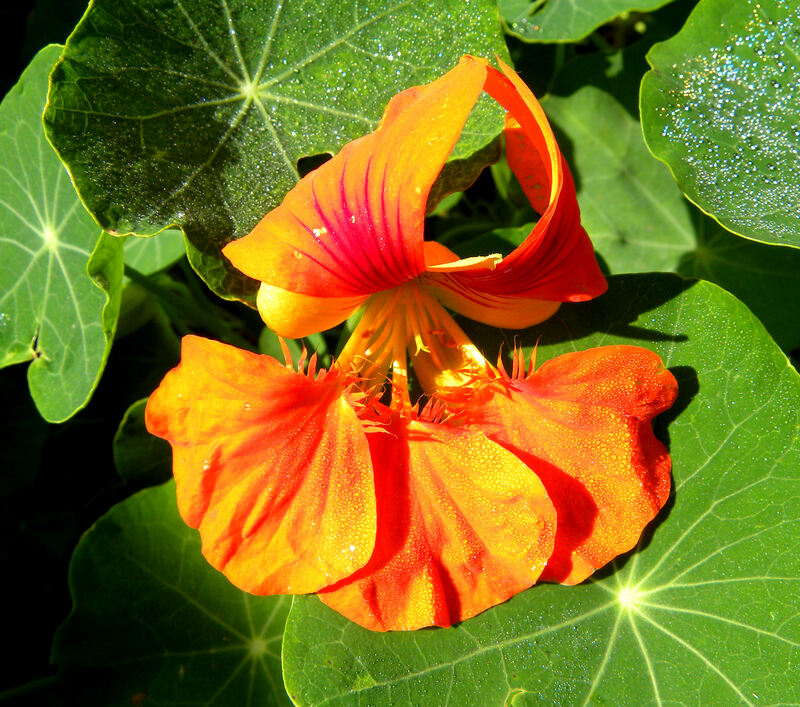 I tried making nasturtium vinegar one year by soaking the flowers in white vinegar for several days, but I didn't really care much for the flavor. Tasted like nasturtiums! The first rose of summer is about to open. Summer? It's APRIL! 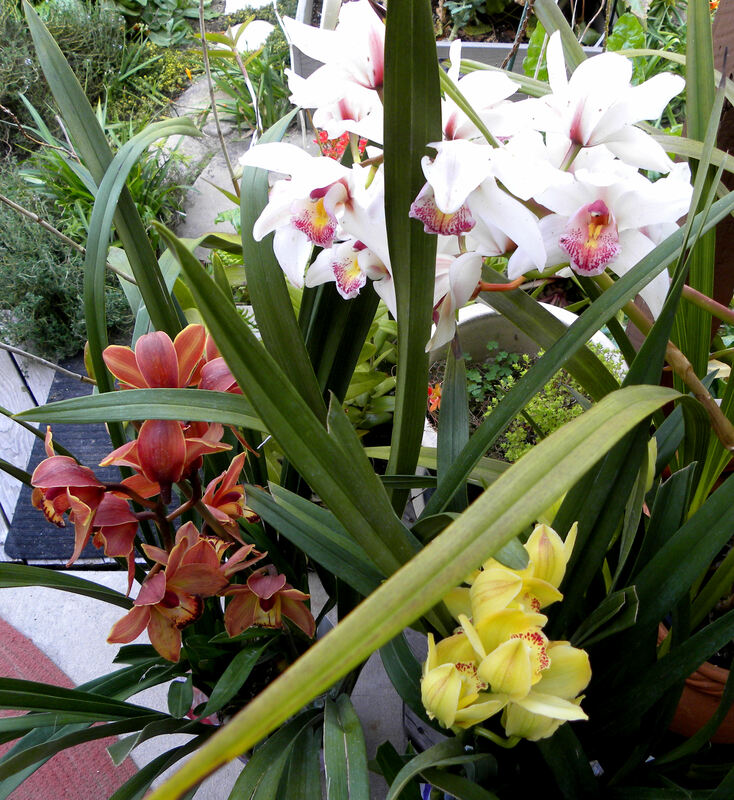 I bought two new cymbidium orchids, the yellow and the rust-colored ones, to add to my existing white and pink one. They look nice in a set of three. 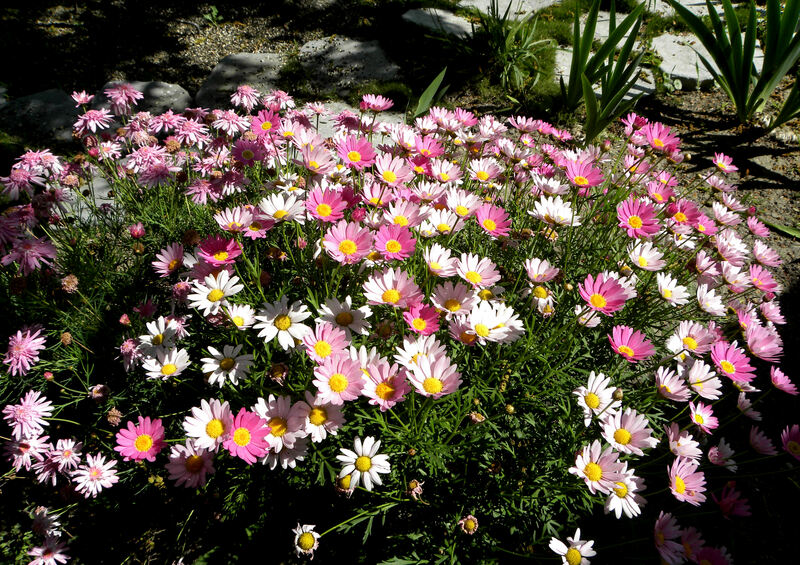 Pink cobbity daisies in the front yard. I want more, but haven't found them at the nursery when I've looked. 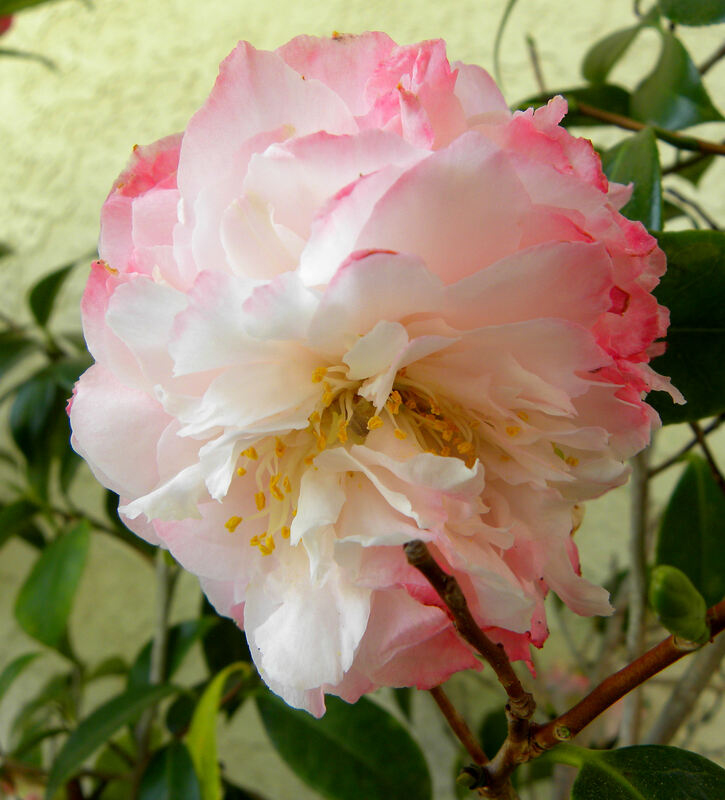 My two early season camellias have finished blooming. Now it is the turn of this late season one. 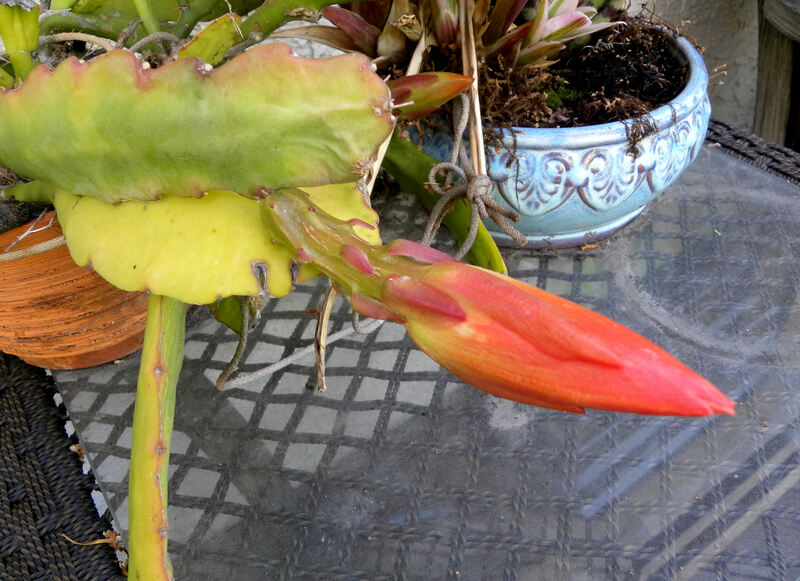 This is the largest bud on my orchid cactus. When they open, they're spectacular, as large as my fully opened and wide-stretched hand. I have two color varieties, a pinky peach and a salmon. OK, none of those were edible, except for the nasturtiums. I put them in for beauty alone. 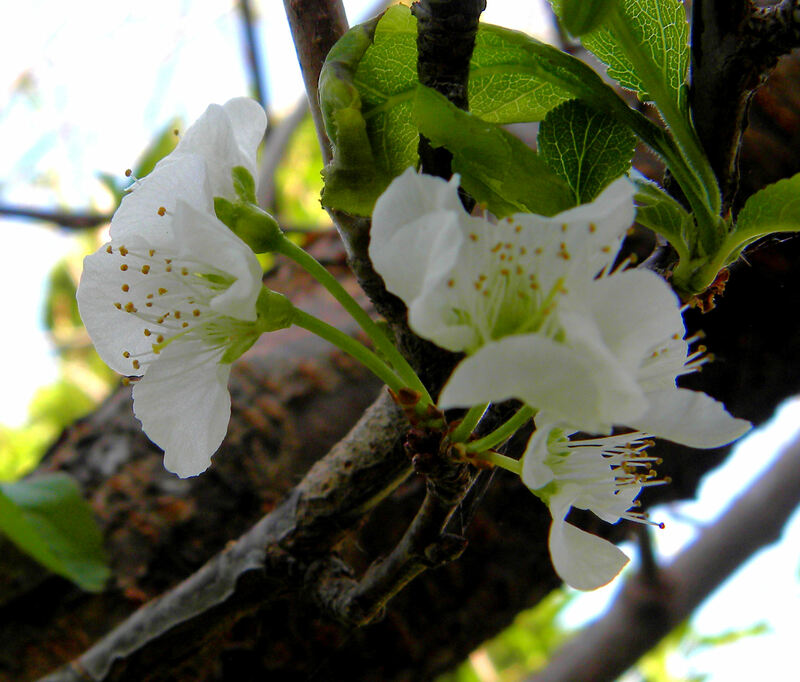 Here are some flowers which promise fruit in the future. My Granny Smith dwarf apple tree is in full bloom. It normally sets about 30 full-size apples. The Gala and Fuji apples are still dormant, as are my two Asian pear trees. However, we had a warm winter, and they might not have received enough chilling to set fruit. Darn global warming! Our Santa Rosa plum is blooming poorly, as usual. We'll be lucky to get a dozen plums. However, that is more than we usually get since the night critters usually get all the fruit. This year I'm live-trapping them relentlessly. We've relocated seven possums already this year. These are lime blossoms from my Bearrs lime tree. Note the tiny limes on the right. That's what they look like after the petals fall off. Most of the flowers don't result in fruit, but we get plenty of limes from the tree anyway. 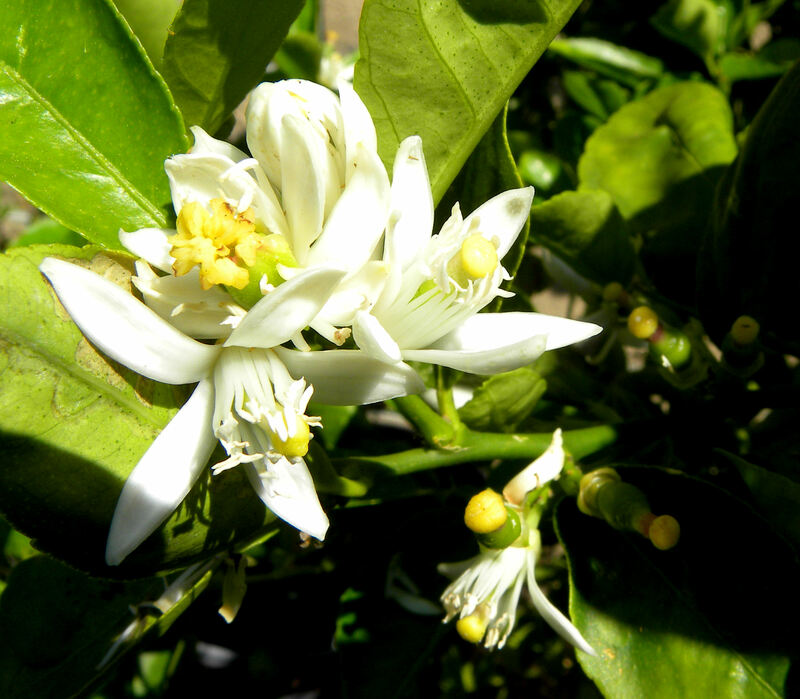 The navel orange and Meyer lemon trees are also in exuberant bloom. These itsy, bitsy little green flower buds are the ones that are exciting me the most. They are the first ever flowers on my Red Flame Seedless grape vines. I planted the vines four years ago (or was it three, can't remember) and they are now showing signs of producing fruit. We have eight clusters of flowers so far, and more may open as the grape vines are just now getting going for the summer. I hope we get actual grapes but a lot of things can happen between now and harvest. Mold, mites, birds, night critters, etc. I have my fingers crossed. 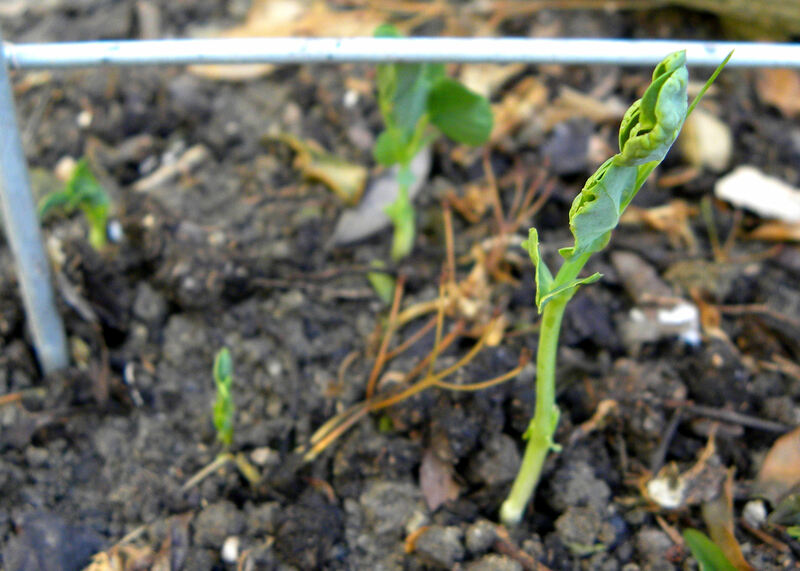 My Mammoth snow peas are up. They sure aren't mammoth at this stage. This is the second planting of 2012. 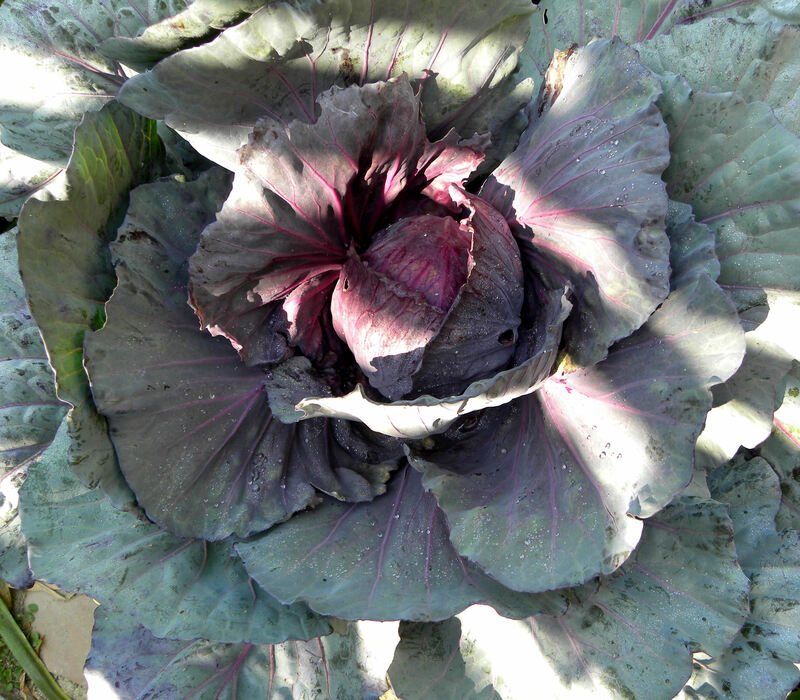 My red cabbages are coming along. In general, my cole crops did poorly this winter. I think it was too warm for them. But I have three remaining red cabbages and all have made heads. They're too small to harvest yet though. I hope they make it to harvest time. 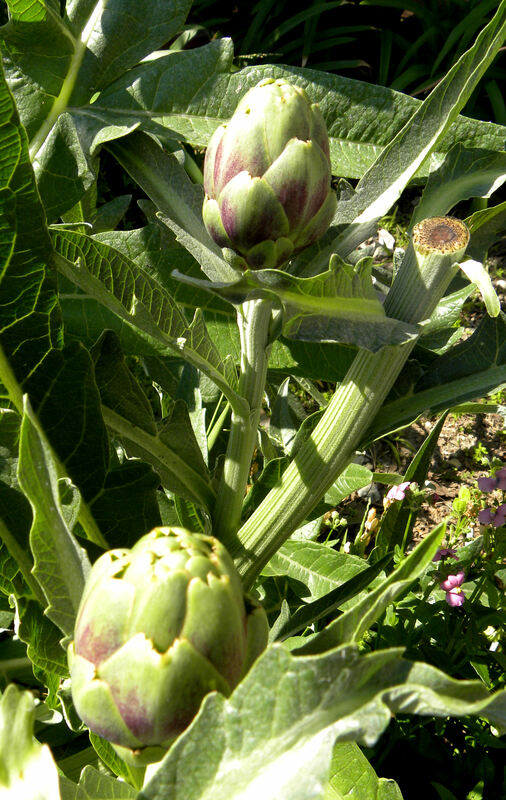 We've harvested and eaten three artichokes so far, with more coming along. I had four artichoke plants that came back from the roots this year. They are a short-lived perennial. I may have to replant this fall. Or maybe I'll get another year out of the existing plants. Time will tell. Our Florida Prince Peach tree is loaded with fruit, about 250 peaches. Last year, they were very small peaches. I hope that they're bigger this year and worth canning. I thinned out the peaches a bit, hoping that the remaining ones would get large, but I probably didn't thin enough. I just can't bear to pick them off as tiny babies. I want them ALL to grow big. This is another view of the Florida Prince Peach. 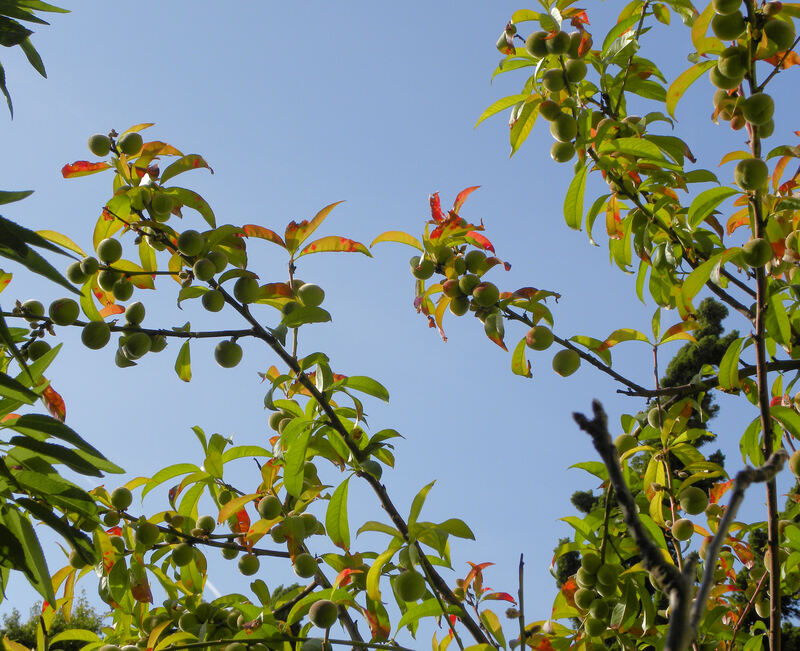 The Babcock Improved Peach is nearly finished blooming, and it looks like it might set 100 fruit this year. The August Pride Peach, which is probably a mis-labeled May Pride, has only three peaches on it. Our Panamint nectarine has set about 30-40 nectarines. 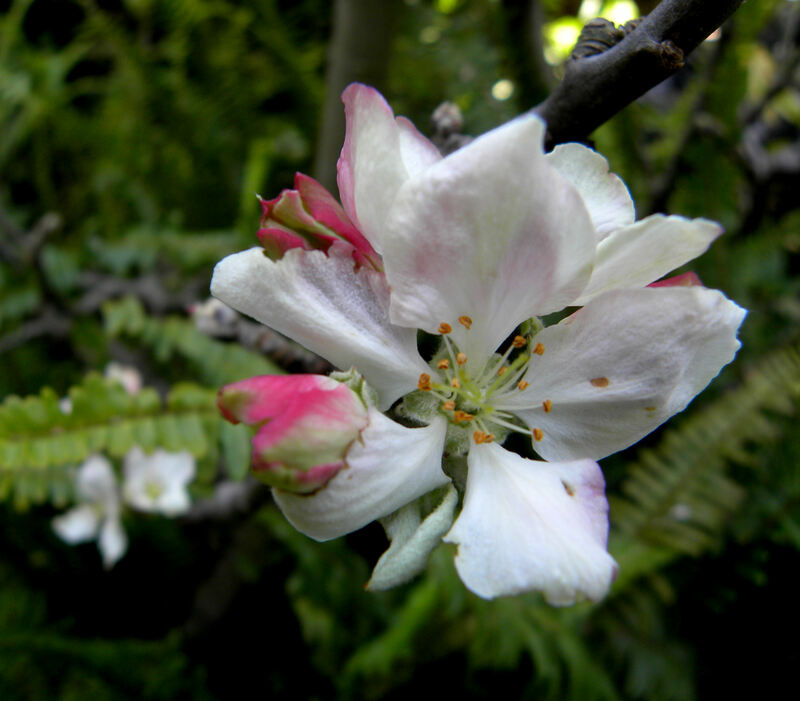 The Snow Queen nectarine is just now blooming, but fruit set isn't likely to exceed a dozen. Our poor little Katy Apricot set only three apricots this year. The critters usually get all of the apricots anyway. I keep hoping to get some for myself. It isn't a plant, but I wanted to show you that I'm still using my new solar oven. I've baked 6 loaves of bread in it so far, plus lamb and lentil curry, beef stew, pot roast, chicken, etc. Amazing thing, it cooks with just the heat of the sun. I'm fighting global warming every way I can. I’ve done a pretty good job of keeping up with the Excel spreadsheet of my harvests this year, if not getting around to blogging as often as I’d like. Here is a summary of what my garden has produced so far this year. Note that this is the production for my first quarter, not for the week. The harvest for this week was 1 oz green onions, 12 oz artichokes, and 8.5 oz of yams. To see what others are harvesting, visit Daphne’s Dandelions. This entry was posted in Uncategorized and tagged apples, artichokes, avocados, backyard chickens, flowers, Fruit, global warming, Greenwood Garden, Harvest Monday, iris. Ida Red, photos, southern California, vegetable garden. Bookmark the permalink. Boy I would so trade yo some of my kale for some of your avacados. I haven’t had one in quite some time. Sorry, Daphne, we live too far apart. Daphne, wish you lived in this corner of the world so I could give you some avocados. You have wonderful space, I have warm winters. It’s a trade off. Beautiful flowers and way to go hens! I have a heck of time in starting seeds for nasturtium, they never germinate for me, how did you do it? Oh, Mac, I do nothing at all. The silly nasturtiums self-seed in our yard. Love the color or your Ida red bearded iris. They would be gorgeous interplanted with the whites. 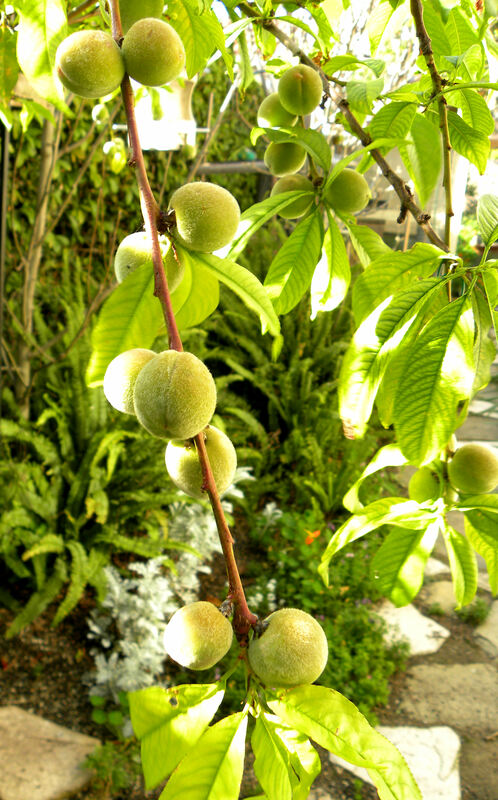 One year I could not bear to thin my Asian pears and ended with tons of little fruits. Learned my lesson. Thanks for sharing your garden bouquets. Norma, I have Asian pear envy. I have harvested a total of ONE pear in the three years that we’ve had our trees. They just don’t seem to get enough chilling here in coastal southern California. I keep hoping. You have a lovely amount of potential fruit there – very jealous. Every year I think my cabbages are taking too long and will never make it before I need the bed space for tomatoes and every year they get big just in time. Liz, I hope for the same good luck, because my tomato transplants are chomping at the bit to get planted. Wow, you have a very lovely garden! Love every bit of it! My Santa Rosa’s often bloom too early and get caught by a late frost; they seemed to have had better timing this year; now if I can just keep the birds and rats off I’ll be doing good! Maryhysong, birds, rats, possums, raccoons. We’ve got ’em all. Darn night critters. Thanks for reminding me to pull out the solar oven! I usually use it as a “summer kitchen” for things like roasting beets and cooking beans, so it’s great to see what you’re doing with it. Local food + local energy! 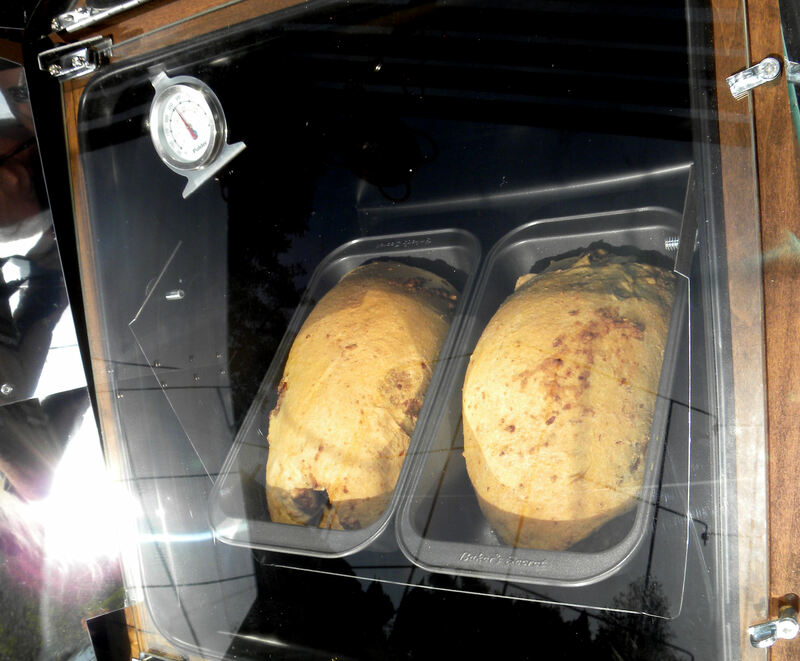 Leduesorelle, I’m glad that there is another solar oven user out there. Reminds me, I need to get mine preheating so I can cook tonight’s casserole. It’s going to be baked beans with onions and leftover Easter ham. Maybe I’ll bake some potatoes at the same time. I just love my solar oven. We were just discussing whether or not we got enough chill hours this year. Some of our pear trees went straight to leaf, and skipped blooming altogether. I did just read this morning though the US just had its warmest March on record. 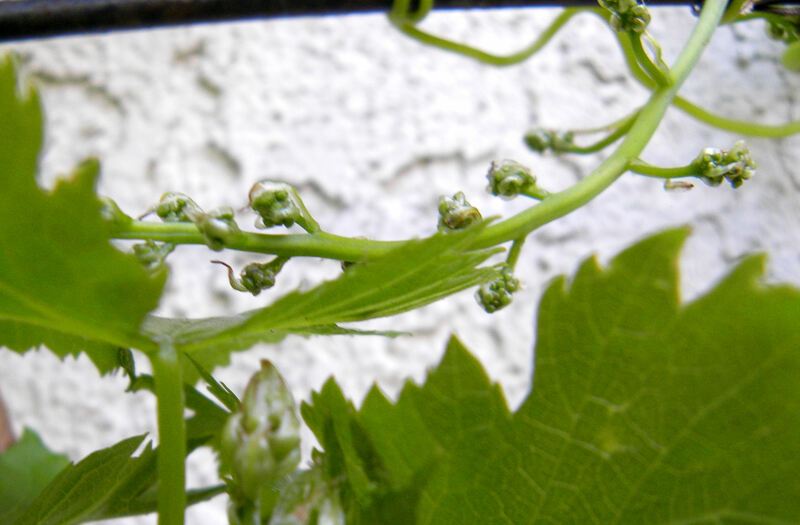 Congrats on your grape flower buds! We grew a flame at our last house, and I loved being able to walk into the garden to pick our own! Clare, I’m happy to know someone else was successful growing red flame grapes at home. I admire my little buds every day, wondering who will get them first–aphids, birds, night critters or me. I recently became interested in growing some vegetables and started looking at different sites for information. With the help of my boyfriend we were able to build two decent sized planters. I know I will be trying to grow two types of tomatoes, some lettuce, herbs and maybe one more item. Since we plan and hope to eat what ever we grow, I wanted to make sure I obtain a quality organic soil, however from my research it is not clear what this should be. May I ask you what type of soil you use or recommend? I also in zone 24, southbay area. I would need about 22 cubic ft to fill both planters. Thank you. Ali from South Bay, I use E.B. Stone organic potting soil, Edna’s Best, and Miracle Gro organic potting soil. All have worked for me. I also use E.B. Stone Sure Start organic fertilizer, and their Tomato and Vegetable fertilizer later in the season to keep things going. Good luck. I am trying not to get discouraged, it seems the more I read about growing your own vegetables the more complicated it becomes. But I will say reading your article on why you garden gave me a little boost again.